Everyone has that one game (at the very least) that brings out uncontrollable rage in them. Even the most placid man (or woman) can be forced to unleash the inner beast when faced with an irritatingly difficult game. 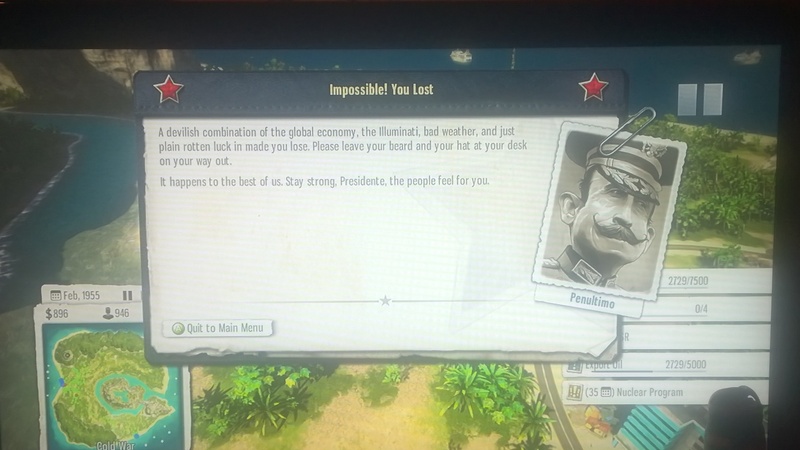 For me at the minute my rage game is Tropico 5. I spent the entirety of a Monday night attempting over and over again to beat just one mission. Three weeks later and I am no further in the game. In actual fact I’ve gone backwards by restarting the campaign in the hopes that by the time I meet this ridiculous challenge again I will be better prepared. I have played this specific mission so many times now that I know exactly where I have been going wrong and no matter how I change the way I approach the challenge it makes no difference to the outcome whatsoever. If I keep the people happy I run out of time. If I rush to do what I need to do in the set time limit my people rise up against me. In fact no matter what I do the people rebel. This game has gotten me so frustrated that I have actually had to walk away from it and have instead been playing Dragon Age 2. Whether or not I will ever complete that mission I have no idea. But as with a bad relationship I need some space right now.